Almunecar webcams are cameras showing you live images and pictures from the town of Almunecar – a beach resort approximately 65 kilometres east of Malaga on the Costa Tropical area of Spain. Web cam are digital cameras directly connected to the Internet. Some people also refer to these web camera as web cam Almunecar cams. Almunecar was once a small fishing village but now derives most of it’s income from tourism. 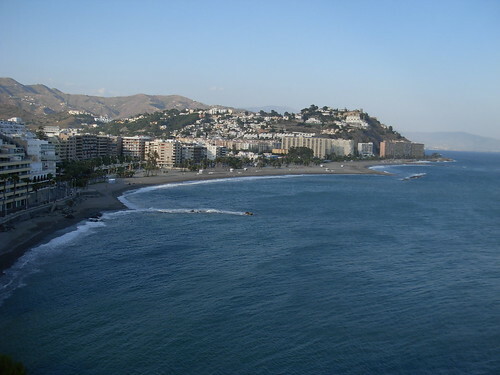 Almunecar has escaped much of the high-rise buildings which in our opinion have spoiled some parts of the Costa del Sol coast. As well as our webcams showing pictures and images of Almunecar we also have an amazing video below showing the most famous sights, best attractions and notable landmarks in Almunecar. If you are interested in webcam Almunecar then you may be interested in our other pages devoted to information on Almunecar – in particular you may be interested in our page on the weather for Almunecar. Almunecar webcams are great for people who have never been to Almunecar and who want to see what Almunecar looks like.